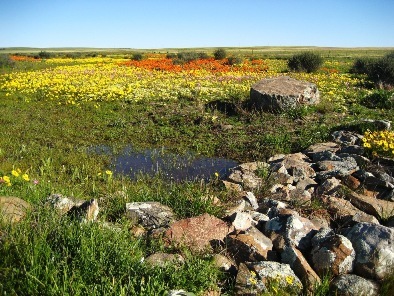 Because most of the rain on the Bokkeveld Plateau falls in the winter and spring, the greatest displays of wild flowers occur from August to mid-October, covering areas of the Garden with a kaleidoscope of colours. Most of the annuals, geophytes and succulents flower at this time, but even though the bright displays of annuals disappear in October, there are interesting plants to be seen until the end of November. 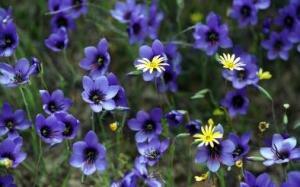 During the flowering season, annuals and geophytes cover the ground in a rich carpet of colour. 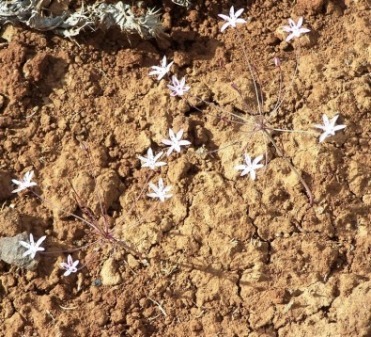 The famous red Bulbinella latifolia var. 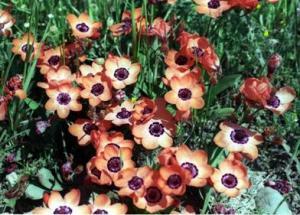 doleritica, the large red-flowered Romulea monadelpha, yellow and chocolate Hesperantha vaginata, and the dull-coloured but highly fragrant Gladiolus scullyi are common. The annuals include the delicate white Cotula nudicaulis, various species of Nemesia, but especially the striking Nemesia cheiranthus, and mauve-flowered basterpershongerblom, Senecio cakilefolius. 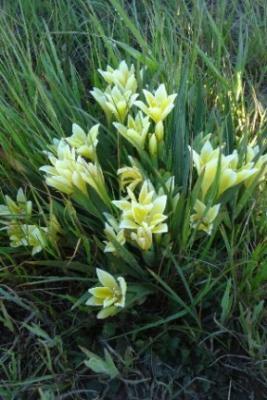 The geophytes include many Romuleas, Lachenalias, Ornithogalums, some Hesperanthas and many more genera. Most spectacular are the brilliant, deep blue Pride-of-Nieuwoudtville, Geissorhiza splendidissima, sky blue bloukalossie, Ixia rapunculoides and the two finest Sparaxis species, the coppery pink Sparaxis elegans and damp loving Sparaxis pillansii. 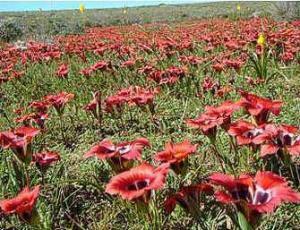 Autumn is not usually a time for brilliant floral displays, but the Bokkeveld Plateau provides a magnificent autumn show in mid- to late-March when species of the Amaryllidaceae make a spectacular appearance, triggered by a drop in temperature and a late summer shower of rain. 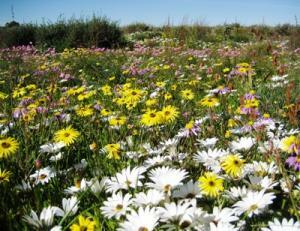 At this time the renosterveld and dolerite soils become the stage for a dramatic display of floral fireworks. 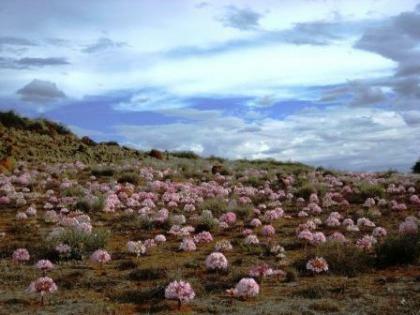 Brunsvigia bosmaniae sends up its candelabra-like flower heads of large pink flowers, covering the veld brilliantly, while the rounded, yellowish flower heads of the rather strange-looking Crossyne flava are scattered about like sunbursts. Boophone haemanthoides, the poisonous gifbol or kwaslelie, produces dense, flat-topped heads of white, delightfully scented flowers in the rocky dolerite hills. 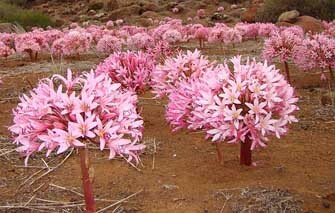 Haemanthus species appear in various soils and include the slender, pink flowered H. amarylloides and the stiff, scarlet paint brush, H. coccineus. The Nieuwoudtville area compensates for the scorching heat of the hot summer months (December – February) by having endless blue skies and the most beautiful summer evenings. Most of these evenings can be spent outside under a canopy of brilliant stars. During these hot and dry months the bulbs which create such spectacular displays during winter and spring stubbornly persist underground in a dormant state, patiently waiting for the first winter rains so that we, once again, can be spoilt with their rich colours and heady perfumes. 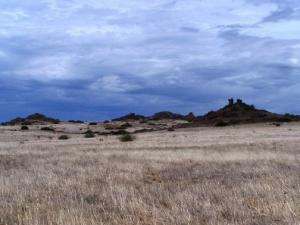 Early morning and late afternoon are wonderful times to go for walks, cycle in the Garden or to meditate while sitting on the age old dolerite rocks warmed by the sun. You can feel yourself being regenerated by the sense of space that one experiences here. 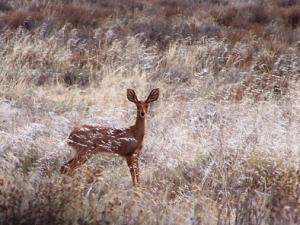 The start of the wild flower display during the early winter months depends on various factors such as rainfall and temperature. Different types of Oxalisspp. provide quite a spectacular display during the early winter months. Some of the plants that flower earlier are Veltheimia capensis (May – July), Lachenalia maughanii (April – June), Daubenya capensis (May – June), Massonia depressa (May – July) and Daubenya stylosa (May – June), as well as the beautiful endemic and Red Data deep-purple Lapeirousia oreogenaspecies. The beautiful glossy romulea starts flowering as early as July and can carry on flowering into October depending on the weather conditions. The same is true for Babiana praemorsa, which normally carries on flowering until late-August.